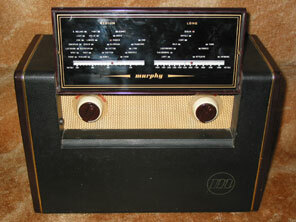 Also introduced in 1954 was the BA228 mains/battery portable. This is an unexpectedly heavy and bulky set, and does not seem to have sold too well. That is perhaps not surprising as the mains/battery sets from Ultra (like the R784 and R786 Coronation Twin) were smaller and had a more pleasing cabinet design. In addition the Ultra sets were several pounds cheaper. 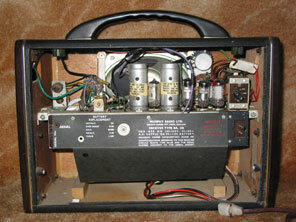 That said, the BA228 was technically superior to the Ultra's, as it incorporated six valves and two metal rectifiers. To my mind though all that effort is perhaps wasted when the resultant sound is delivered through such a small loudspeaker. When examining the set for the first time without a service sheet one can be taken aback as one notices there are only five valves on the chassis deck. The other valve (heptode frequency changer) is there, but it hangs downwards beneath the chassis! 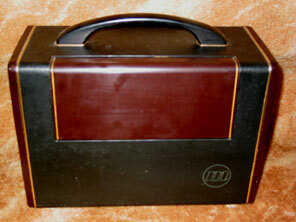 The set has a flap at the front, which in the closed position is plain bakelite (see picture below). However it can be lifted up to reveal the tuning scale. Behind the scale is a recess where the volume, wavechange, tuning and mains/off/battery controls may be found, located as concentric controls. To operate the tuning cursor two interconnected drive cords are required, of length 34 and 41 inches. The speaker is situated behind the expanded metal grille between the concentric controls. The mains lead is in the form of a detachable plug that engages with a socket in the chassis. The mains lead is very often missing, or permanently connected directly to the chassis, because the plug on the end of the lead deteriorates badly, and seems to be of a type only used in this radio. The plug and socket on the example shown is original, but the plug has been reinforced with "plastic padding" to maintain its shape. Valve line up is 1C2, 1F1, 1FD1, 1FD1, 1P1, 1P1 and 011L999 & 15C997 metal rectifiers.